UNH scientists are studying the American horseshoe crab in Great Bay. I was fortunate to have a private tour of the University of New Hampshire's Jackson Estuarine Lab (JEL) at Adams Point in Durham today, thanks to Helen Cheng, a young scientist studying American horseshoe crabs here. I connected with Helen while researching my book and found her enthusiasm for her work so contagious that I included a short segment in the book about the fascinating research going on at JEL. Helen and her colleagues actually dive the bay each summer looking for juvenile horseshoe crabs. With the strong current and amount of mud found here, she describes it as very disorienting and like "diving through chocolate milk." You can get some research updates and learn some great facts about horseshoe crabs on Helen's blog and a little further in this post, too. line the path to the shore. The shoreline on this part of Great Bay doesn't resemble a soft sand beach in any way, but it's a beautiful natural spot just the same. There are some very large rocks, even larger than what you see in this photo. Great Bay was formed by glaciers that came down from the Arctic, so I'm guessing the big boulders found here were pulled up from the bedrock by those giant ice sheets more than 10,000 years ago. Today the shore is filled with trees, rocks, grass, and seaweed, but is still quite walkable. Before delving into the features around Adams Point, I want to share a little of what I learned about horseshoe crabs today. 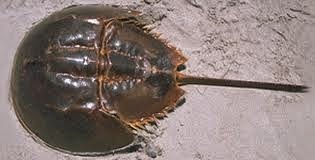 The first interesting fact is that while horseshoe crabs resemble crustaceans, they are not crustaceans at all. They belong to a phyllum that is more closely related to spiders. Also young horseshoe crabs molt, shedding their shells about every two weeks, to accommodate their growing bodies. Once they reach maturity (age 5 to 7), they no longer molt. This fact explains why you can find so many empty shells on the shore. And that spiky looking tail they have? It's not used for self-defense, but simply to flip themselves over. Who knew? Each spring, the crabs make their way to shore to spawn. The females lay up to 4,000 olive green eggs in a sandy nest on the shore. (Hence the title of this post, which I borrowed from a Jackson Lab brochure.) This spring, the lab harvested some of those eggs and "hatched" them in the lab. I saw tiny, tiny crabs, no larger than a small seed. Finally, UNH researchers here can use your help. If you see a horseshoe crab near Great Bay (especially if it has a tag on it), please take a moment to report the sighting at this online survey. Why should you head out to Adams Point...if you can't get a tour of the lab? Well, the Adams Point Wildlife Management area offers a 1.5 mile trail with many water views. People come here to walk their dogs, take a nice gentle hike or to snowshoe in winter. 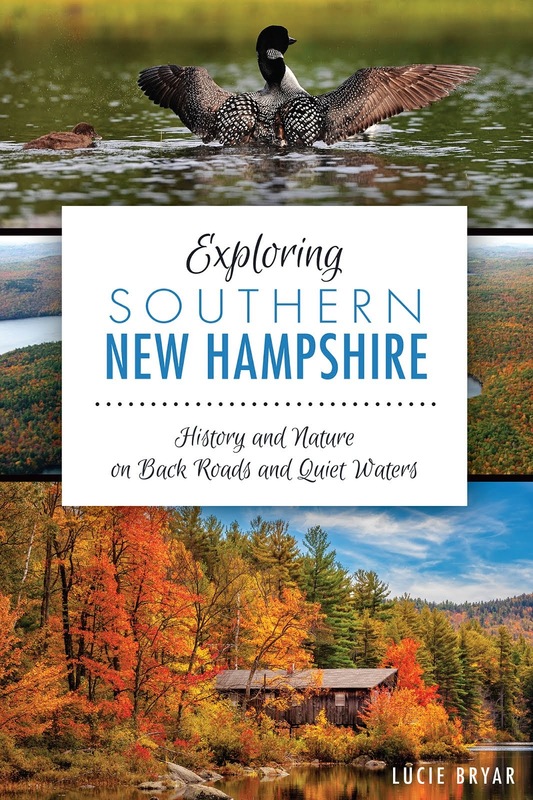 You can learn more about the trail on Hike New England. There's a very active bird population as well. I saw a heron today, as well as many other birds. There are osprey in the spring and bald eagles in winter. If you're a birder, I'm sure you can identify many more than I can. Last but not least, I saw a sign on Bay Road for a Heron Sanctuary. 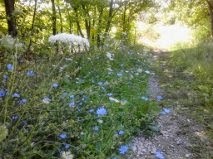 I didn't want to venture down this wooded dirt road alone, but it's on my list for next time. So you can see, there's a lot to explore in this corner of Newmarket and Durham. 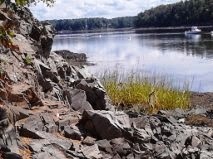 If you have a chance to get out to this part of Great Bay, write in and let me know what you find! Directions to Adams Point: GPS 85 Adams Point Road, Durham NH OR from the south, take Rte. 101E to exit 10 towards Exeter. Turn left on Route 85. Stay straight on 85 for several miles until you reach Route 108 toward Newmarket. Turn left on 108 and follow it through town for another three miles or so to a right turn on Bay Road. Stay on windy and narrow Bay Road for about 4 miles to the sign for Jackson Estuarine Lab. There are a couple of parking lots here.